Conventional insect poisons kill with gross impact on the insect's respiratory system. The poisons in these insecticides are also very toxic to humans. By contrast - Insect-a-Shield is odorless and harmless to humans and animals, but it still causes bugs to rapidly dehydrate and die. Fossil shell flour can be used to scrub the intestines and can kill parasites in animals and mammals. Organic Farmers - you'll love this! 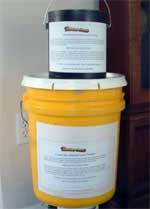 Insect-a-Shield contains diatomaceous earth. Fossil shell flour is a particularly pure variety quite safe for consumption. 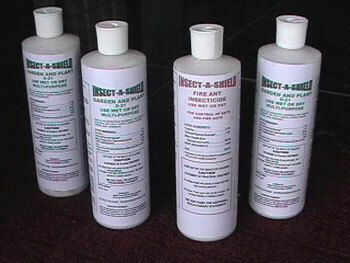 Insect-a-Shield is a natural and safe alternative to poisonous insecticides. Added to the varieties of Insect-a-shield for killing bugs externally, is Pyrethrum, one of mans oldest insecticides - highly lethal to insects. It comes from chrysanthemum flowers located in Kenya and Ecuador and is a digestible vegetable extract of the flower. Piperonyl butoxide is another vegetable extract that is an insecticide in its own right. It is added to Insect-a-Shield to further enhance the Pyrethrum making it even more effective. Together, these three ingredients make Insect-a-Shield a safe and effective bug killer. Do your part to help reduce the huge problem of contamination to our water and plant life, caused in great part by the widespread use of conventional chemical pesticides. Insect-A-Shield is a safe and superior alternative to these chemicals. 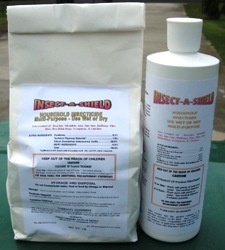 Insect-A-Shield is the natural choice and a fantastic safe alternative for insect control. Apply the power on bugs directly or put it where they travel. You can mix the powder with water to make a convenient spray for use in your home or garden. All Diatomaceous Earth is not the same. There really is a difference! There are over 25,000 varieties of Diatoms. Each deposit is different because of ocean currents mixing in whatever foreign material that might be handy. Although it is sold as an anti-caking agent, that is perhaps what it is known and used for the least. Users of Fossil Shell Flour who feed it to livestock have seen noticeable improvements in the health of their animals. “Now and then, a man would say, ‘did you know that if an animal has arthritis and eats food with Diatomaceous Earth in it, that the arthritis goes away? Insect-a-Shield comes in seven varieties, however you need only the Household variety to kill all varieties of insects. Simply sprinkle Insect-a-Shield powder on any insect or in areas where bugs might travel, and they die. Government regulatory agencies seeking to justify their existence, create ridiculous policies requiring unnecessary warnings on the label. This is clearly the case with Insect-a-Shield. You can safely put fossil shell flour in your animal's feed. Hey, nobody has told the government yet that what they do should make sense. Because this natural product kills bugs the maker pays the EPA $5,600 each year for permission to sell “insecticide”, and must also pay each individual State Dept. of Agriculture a fee, ... so thanks to your government "Protecting you" the cost of Grain Protectant to the user is higher than the cost of Fossil Shell Flour. It's clear why the word ‘bureaucrat” upsets farmers every time they hear it! (Side note - After a petition was filed with the EPA, the agency issued diatomaceous earth an exemption from tolerances from pesticide chemicals in or on raw agricultural commodities. They found that the product did not pose any public health risk. However, to this day, the Grain Protectant is still labeled like a dangerous substance and of course, the EPA and state agencies still collect their annual fees. Over the past 30 years, discoveries and claims about our Fossil Shell Flour continued to come in from customers, veterinarians, farmers, and universities. For the past three years, there has been a growing number of people writing to us about the health benefits that they have received from taking FSF on a daily basis. An article in a national magazine reported on a Canadian scientist who administered Diatomaceous Earth in tests and found that it stopped E-Coli poisoning immediately. Austrian scientists discovered that Diatomaceous Earth reduced cholesterol levels in the blood and kept it down. Texas A & M did a test on worming. “Taking thirty pregnant goats, the first ten were wormed with Ivomectin, a product of Merck Labs – the same people that put out Vioxx. The second ten were wormed with a mixture of Diatomaceous Earth and Ivomectin and the third group was wormed with just Diatomaceous Earth.” The group wormed with just Diatomaceous Earth was 100% free of worms. Another vet from Canada working with 2000 calves discovered that calves getting Diatomaceous Earth in their diet did not have scours. Scours is a disease that causes diarrhea (and severe dehydration) in young pigs and calves. The disease spreads very quickly and can kill many of the young pigs and calves on a farm in a very short time. A medical doctor, giving it to patients (mostly elderly) whom he could not seem to help, found that regardless of what their problem was, they seemed to get better! Finally, he began to research and found a number of articles on the Internet and in magazines and two books on the body's desperate need for silica. The toughest part about selling Fossil Shell Flour is that we are prohibited from telling potential users all the wonderful things that are product has done for others. In fact, we are required not to make any claims about what the product can do. But without the millions of dollars required to carry out the double-blind studies that the FDA will accept, we are forced to do just that. But, as people began to discover for themselves all the wonderful things that it could do... they started to tell anyone who would listen about the benefits they were getting. word of mouth advertising has been absolutely essential to our business. We began to get calls from total strangers, asking for that "stuff" that "cured arthritis"," got rid of parasites"," kept slugs out of the garden", "helped plants retain more water", "killed bed bugs"... and dozens of other requests. So we simply offer our product as an anti-caking agent and if customers find any other benefits, it’s a bonus! Of course, I've heard of people besides myself who reportedly are taking a heaping tablespoon of "Fossil Shell Flour" a day with water, juice or anything that works for you. I drink a tablespoon with a banana smoothie daily. It's GREAT!